NC REALTORS® Housing Foundation, the charitable arm of NC REALTORS®, serves the community by providing affordable housing opportunities and supporting those whose housing has been impacted from natural disasters. On Sunday, April 15, EF-2 tornadoes touched down in Guilford County and neighboring Rockingham County. The hardest hit area was East Greensboro, which is also one of the poorest areas in Guilford County. Guilford is more urban than Rockingham and preliminary estimates suggest that 95% of storm damage occurred in the City of Greensboro. Although these are not final estimates, the City of Greensboro has confirmed that 958 residential units (or slightly under 1,000 families) were impacted by the tornadoes in Guilford County. On April 20, Governor Roy Cooper declared a state of emergency in both Guilford and Rockingham Counties. Immediately after the tornadoes, NC REALTORS® and NC REALTORS® Housing Foundation began a supply drive for tornado victims. You can read more about those initial efforts and how to help with supplies here. After conversations about partnering with local government and key nonprofit organizations, NC REALTORS® Housing Foundation applied for a grant from the National Association’s REALTOR® Relief Foundation. On May 2, NAR Board of Directors President Martin Edwards notified NC REALTORS® CEO Andrea Bushnell that the grant for $50,000 had been approved. These funds will go toward tornado victims whose housing was impacted. Specifically, the aid will pay for one month’s rent or mortgage payment. One hundred percent of these proceeds will pay for housing for tornado victims. The Greensboro Regional REALTORS® Association (GRRA) has pledged $2,000 for this effort, and the officers of the Board of Directors for NC REALTORS® Housing Foundation have pledged $5,000 of that organization’s resources toward this campaign. Click here to apply for housing assistance. The application outlines these required documents, and our volunteers will explain the process face-to-face with tornado victims. 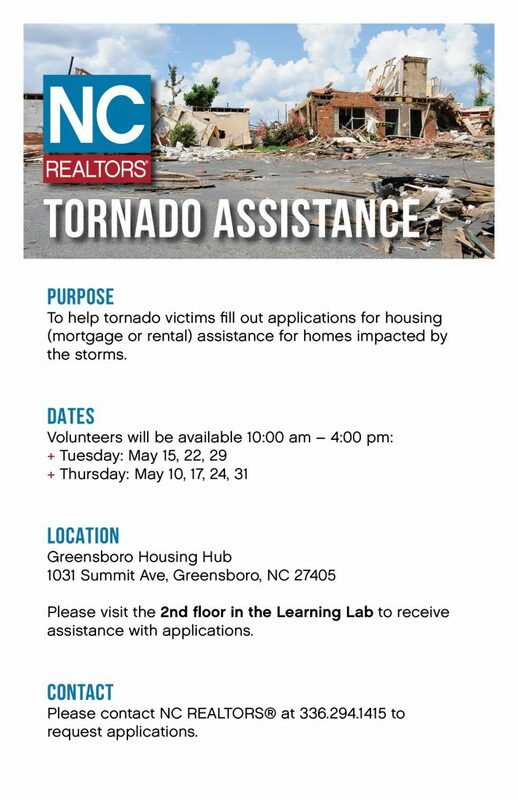 By communicating through the City of Greensboro and key supporting agencies, NC REALTORS® will advertise the necessary documentation required as well as publish our schedule for assisting these victims at the emergency centers. Our efforts do not end with direct monetary assistance to housing victims. GRRA has pledged $4,000 to partner with Community Housing Solutions, a nonprofit that helps repair and rebuild housing for the elderly, disabled, and storm victims. Pending review, NC REALTORS® Housing Foundation will provide a Matching Grant of $4,000 to support this effort. This means that teams of REALTORS® will work together to rebuild East Greensboro. If you also want to help in the efforts described above, please donate funds to NC REALTORS® Housing Foundation for tornado relief. In the online form, there is an open field called “Other.” Click the button in front of “Other,” then type in the words “tornado relief” in the open field to designate your donation specifically toward these efforts. All fully tax deductible donations here will complement the $57,000already pledged for direct housing aid. You can also contact Nicole Arnold at narnold@ncrealtors.org or 336-294-1415 if you want to assist in clean up and rebuilding efforts or if your business or local REALTOR® association wants to make a substantial contribution.